You don’t need a big top to host a breath-taking performance! In fact, there are many options you can choose from to mesmerise all your party invitees. From unusual jugglers to glow-in-the-dark acrobats, here are our top 5 picks for a circus themed event. Everyone loves the disco era, but what happens when one great acrobat sees a giant, sparkly strobe light? What could be a nostalgic show turns into a whole new concept. The rotating mirror ball becomes a stage for an extraordinary contortion performance capable of capturing the attention of all your guests. Our mirror ball artist has been performing at the most exclusive events in the UK and around the world. 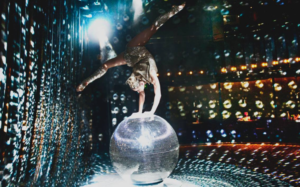 The Mirror Ball contortion is the ideal act to bring the wow factor to the most glamorous events! Watch an example here. 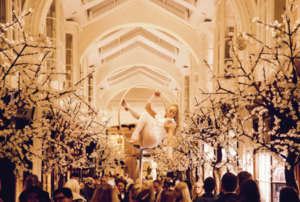 If you are hosting a circus themed night in a small venue, you can still afford the luxury of having a stunning aerial performance in the middle of the room. For example, the lollipop hoop allows brilliant circus acts to spin around the hoops, with no need of trusses. The performers are available in a variety of costumes and additional walkabout performers can be added to bring any theme alive. The lollipop is the ideal centrepiece at drinks receptions. This circus act will hypnotise an entire audience. It creates a surprise effect that is always managing to impress. For this reason, it is ideal for corporate events, private parties and product launches. Available in various formats and choreographed to different types of music, each show has its own unique twist and shows unbelievable skills. Here is Silvia, one of the great performers we work with. We love her artistic touch and original dance/hoop routines. Just when you think you have seen them all, here it comes Ulrike, a wonderful foot juggler. 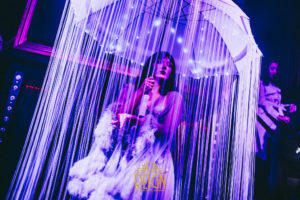 Her skills and artistry make each of her acts truly unique and capable of wow any guests. Ideal both as ambient performance or as a main featured show at an event, this act brings an old classic to a new light. Ulrike is a very experienced foot juggler that has been performing all over the world. She can be the classy Marlene Dietrich in a vintage show, or perform a traditional juggling act suitable for the whole family. She can even customise her umbrella prop to suit any themed event. Seeing is believing! Watch her here.